Integrated Territorial Investment (ITI) is a new tool introduced in the Common Provision Regulation (CPR) for use during the European Structural and Investment Funds (ESIF) programming period. Its aim is to make it easier to run territorial strategies that need funding from different sources. ITI also promotes a more local or ‘place-based’ form of policy making. On examining approved programmes, it is clear that Member States, regions and cities want to make use of this tool. Article 36 of the CPR does not precise how an ITI should be set up, which is in stark contrast to existing Articles on Community-led local development (CLLD). This lack of guidance offers flexibility but might also lead to uncertainty. Various questions come to mind such as: What should a territorial strategy look like? How can different funds be combined? How should a delegation be structured? And how can outputs and results be measured? There is a common misinterpretation that ITI is simply a technical tool that funds projects in the same territory without any thought given to the situation on the ground. We aim to counter this misinterpretation by describing what an integrated territorial approach could look like when implementing the Europe 2020 strategy. To illustrate the process from A to Z, the second part of this document will set out four scenarios, each describing how ITI can be used in practice. 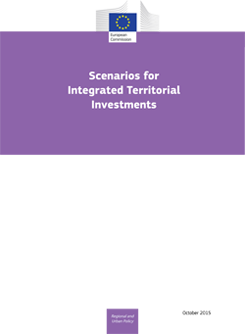 These scenarios will clarify ITI’s link to several provisions in the relevant regulations and at the same time underline its relevance to the wider concept of an integrated territorial approach.